Based on the activity of 9, the phenols 10, 11, 12, 13, 14, and 15 were synthesized, and their in vivo activities determined. The results are summarized in Figure 4. Based on the structure-activity relationship as described in Figure 2 and also on the biological activities of the possible metabolites as described in Figure 4, several new analogs were synthesized. 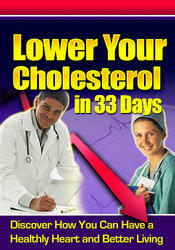 Ezetimibe was found to be the most potent among all the analogs synthesized in inhibiting the absorption of cholesterol. The structure of ezetimibe8 and a summary of its design is presented in Figure 5. The keto acid 16 was converted to 17, and then reduced to 18 using Corey's oxazaborolidine catalyst (Scheme 2). The titanium enolate of the silylated derivative of 18 was condensed with the silylated phenolic Schiff base 19, to yield 20. The basic nitrogen atom of 20 was silylated in situ, and then treated with tetrabutyl ammonium fluoride, to form the azetidinone ring. Final deprotection of the silyl groups with acid yielded ezetimibe. The cholesterol absorption inhibitory property of ezetimibe was compared with SCH 48461, and the results are summarized in Table 2. In every species studied, ezetimibe showed dramatic improvement in activity when compared with SCH 48461, and, in monkeys, ezetimibe showed the greatest activity. Scheme 2 Reprinted with permission from Clader, J. W. J. Med. Chem. 2004, 47, 8. Copyright (2004) American Chemical Society. Reprinted with permission from Clader, J. W. J. Med. Chem. 2004, 47, 7. Copyright (2004) American Chemical Society. a Blood levels significantly lower for ezetimibe. In parallel, we studied the synergistic effect of ezetimibe, along with a statin for lowering cholesterol levels. 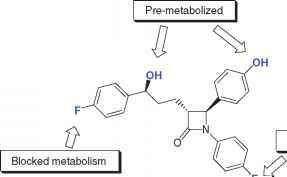 Thus, ezetimibe (0.007 mgkg_ ^ and lovastatin (5mgkg_ ^ were administered orally to two different sets of chow-fed dogs for 14 days. Neither ezetimibe nor lovastatin showed significant activity; however, the combination showed a dramatic reduction in serum cholesterol levels (Figure 6). Based on all these results, ezetimibe has progressed to the clinic as a monotherapy agent and also in combination with simvastatin. The combination drug, named Vytorin, was jointly developed by Schering-Plough and Merck. Based on all these observations, ezetimibe was advanced alone and also in combination with simvastatin and atorvastatin in the clinic, and the results are presented in Figure 7. 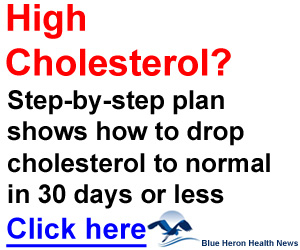 In the clinic,10-13 ezetimibe (10 mg) when administered alone reduced serum cholesterol levels by 18.5%, on average, and in combination with simvastatin (10 mg), serum cholesterol levels were reduced by 51.9%. Based on safety studies and clinical response, ezetimibe has been approved for human use as a monotherapy, and Vytorin (ezetimibe plus simvastatin) has also been approved by the FDA for reducing serum cholesterol levels.